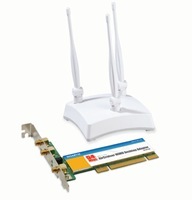 The GIGABYTE GN-WP01GM AirCruiser MIMO Desktop Adapter will provide your desktop PC with wireless access, connecting and sharing your broadband connection and network resources. With increased wireless coverage by up to 6 times the standard 802.11g coverage. Wi-Fi Multimedia (WMM) support for higher audio/video priority assigned for media streaming. The GN-WP01GM comes with wireless security (64/128-bit WEP Encryption and WPA/WPA2) features that will assure you a safe and secure home network. GIGABYTE proprietary SmartSetup 3 will allow you a quick and easy way of setting up your internet connection and wireless network with just a few steps. Device Name: "Gigabyte GN-WP01GM PCI MIMO WLAN Card"
Fix "Clicking the Cancel button cant get response"
If you need the latest windows driver for Gigabyte GN-WP01GM, please visit here.